I'm pleased to announce that trumpet star/teacher Dave Hignett who was faced with redundancy from his position with Northumberland Education has, thanks to people power. and FACEBOOK been re-instated. This is good news as local education needs teachers of his calibre. Thanks to Liz for drawing my attention to the second part of Alyn Shipton's program on the late Sir George Shearing. Love Nancy Wilson doing Blame It On My Youth. It's here for 6 days on the above link. Lance. Olive Rudd (vcl); Herbie Hudson (tmb/hca/vcl); Jim McBriarty (clt/sop/vcl); George Richardson (pno); Alan Rudd (bs); Mike Humble (dms). "Something better to do?" Impossible! - this is The Place! The shrinking Maine Street Jazzmen played to an expanding audience at Rosie's this afternoon. I joke - hurry back King. Drummer Mike was even humbler this week as he played without a bass drum! Such is the strength of Alan Rudd's basslines the rhythm section didn't stop swinging! Soon, Olive took a Sentimental Journey Home and all three songs were spot on. Jim sang Gonna Get A Girl, Way Down Yonder, Avalon - Herbie sang the rest! It was a good afternoon with a good crowd. I bought a DAB radio back in the days of THE JAZZ. When that station went down the Mississippi River my DABBER was relegated to the loft. However, JAZZ FM is now available on DAB (and some cable channels). I must confess that at first I had my reservations as, at times, it is so smooth as to be almost elevator music but, after repeated listenings and the enthusiasm of fellow bandsman Phil, I have come to the conclusion that I was perhaps being a bit harsh and there is a lot of good stuff amidst the blandness. Helen Mayhew's one of the DJs and she certainly knows her stuff. Just heard Dexter Gordon and Bobby Hutcherson on one of the old Blue Note albums. Shabaka Hutchings (tenor saxophone, clarinet & electonics), Neil Charles (electric bass & electronics) & Tom Skinner (drums & electronics). I rushed into The Cluny just in time for the start of the first set to find the place packed to the rafters. I quickly realised this couldn't possibly be a Schmazz gig. The Zed-U gig was in Cluny 2, the smaller satellite venue next door. My arrival took the audience numbers above and beyond single figures - all things considered this was something of an achievement two days after the Gateshead Festival marathon. Zed-U played with an undercurrent of dub reggae; Tom Skinner's constantly shifting patterns locked on to Neil Charles' hypnotic bass grooves. Shabaka Hutchings' saxophone and clarinet rode over the rock steady foundation producing occasional meditative sounds suggesting a Coltrane influence then it was all out biting tenor as the trio reached a crescendo before the sound dissipated into stillness. The trio's sound was different to that of the Loop and F-ire Collectives. Bassist Charles, formerly of Empirical, was central to this welcome change of direction. Charles and Hutchings hail from Birmingham and were working in the same environment as Soweto Kinch before the bright lights of London beckoned. On the evidence of this Newcastle performance it was easy to understand why, at one point, Courtney Pine employed Hutchings. The Schmazz regulars lapped it up. Plenty happening on Friday - no foolin'! ...and then three come along at once although in this case about six plus! Down in deepest South Shields The Customs House Big Band with vocals by Ruth Lambert play the second concert of a two nighter at their home base. At the newest jazz venue to emerge - paradoxically one of the oldest buildings in Newcastle - The Vieux Carré Jazzmen bring their brand of New Orleans to the Lit and Phil (Literary and Philosophical Society) for only the second jazz concert to be held within it's venerable confines. At Darlo Arts Centre The Robert Fowler Quartet should be a must for those who like straight down the middle tenor playing. In Saltburn The Derek Winter Sunshine Band strut their stuff in the Community Hall whilst at the British Legion Club in West Jesmond vocalist Grace Ellen takes centre stage. Broadway Melody are at Jazz at the Fell at the British Legion with Mia Webb on vocal. At Porters on Tynemouth Station there is an intriguingly named combination - Horace Silverman and the White Gardenias. "Horace" tells us something about them; "Take a musical journey through the sophisticated 30's! Hear the most beautiful melodies elegantly played and exquisitely sung by Josie McDonough. An unforgettable night! The Line up consists of: Guitar/fiddle, Bass, Drums, Accordion/Banjo, Saxophone/clarinet and ukelele with Female singer with harmony vocals. Our range of music is from the pens of George Gershwin, Irving Berlin, Hoagy Carmichael, Harry Warren as well as some more ethnic influences. We play our own unique arrangements of jazz and early country standards." Talk about being spoilt for choice! There's also the Safe Sextet at the Jazz Café and solo dinner jazz at the Cherry Tree - all this on top of the Sage Jazz Festival! For further details view Friday's listings in the right hand column. Not exactly on Tyneside I know but the Oxford Jazz Festival which runs over the Easter Weekend starting Thursday April 21 and ending on Sunday April 24 does have a north-east connection. I'm referring to former Extreme Measures' guitarist Jamie McCredie who on the Sunday (April 24) can be heard in concert with his own band the Jamie McCredie Quartet. Other highlights include Soweto Kinch who wowed every one who attended his concert at The Sage, Gateshead, on Friday night; Norma Winstone, Kit Downes, the Bobby Wellins' Quartet and many many more. Two events immediately preceeding the performance by GIO proved to be insightful and heartening. In the Northern Rock Foundation Hall Evan Parker was in conversation with Alyn Shipton (Gateshead Festival's resident interviewer/broadcaster/musician) to discuss his approach to improvisation and his long association with the musical form and its practitioners. Parker remarked, with some pleasure and perhaps a little pride, that he and others have developed ''the scene'' into a global affair. In recent years a collaboration with Spring Heel Jack (John Coxon and Ashley Wales) had opened up new possibilities and developed a new, younger audience. Parker acknowledged that on some occasions the music works brilliantly and at other times less so. The musicians are clearly aware of this and Parker was quick to point out that the audience will communicate its appreciation or conversely show a lack of enthusiasm for a piece of music as it develops. The beauty of the art improvisation is that Parker or others on stage can change the direction of the piece and take it down a different avenue. Where would the Glasgow Improvisers take us as we moved into Hall Two? The audience, seated in the intimate auditorium, happily accepted the bonus of a short set by a group of young north east musicians keen to try their hand at improvising. The ensemble's tutor was none other than Chris Sharkey. The Gateshead guitarist had earlier in the day been in action with trio VD and on this occasion it was Sharkey the conductor. Three guitarists, two drummers and an alto saxophonist were under his tutelage. Thrust into the spotlight, were they terrified? If they were, it didn't show. Sharkey smiled and coaxed, encouraged and smiled again as his young charges did him and themselves proud. This splendid performance demonstrated just how difficult the art of inprovisation is. Will any of these fine young musicians emerge as the next generation of Sharkeys? Time will tell. The Glasgow Improvisers took to the stage in numbers (as many as twenty one of them - I kept losing count!). The orchestra's guests were none other than reeds legends Evan Parker and Lol Coxhill. Throw in the avuncular George Burt, the ubiquitous Raymond Macdonald (free jazz's Alan Barnes if you will) and Honourary Geordie Graeme Wilson playing baritone saxophone and we were set fair. GIO is a co-operative with co-leaders and no leaders. The music evolved from, perhaps, a brief discussion backstage as to who would take command at any given time. As the occasion demanded one of the ensemble would stand up and direct a passage of the music, seeking to change the tone, add colour, silence an instrument or introduce a new voice. Evan Parker obeyed the democratic structure, only once playing for a concentrated period. Lol Coxhill did little until he too offered more, pausing mid-breath to suggest someone should stop him! Guitarist George Burt jumped into the audience to hand out scribbled notes - a diagram illustrating how a particular piece would/should develop. Fascinating stuff and fun too. Fun? What, these deadly serious improvisers? You would be surprised. Mark Holub's Led Bib returned to Tyneside in a joint promotion between Sage Gateshead and Jazz North East. This was a late night gig sandwiched between a full evening of jazz throughtout Norman Foster's landmark building and an early hours jam session in the Central Bar. The band's two alto front line of Pete Grogan and Chris Williams fired relentlessly, driven along by Holub's youthful pummelling of the drum kit. Electric bassist Liran Donin and keyboards player Toby McLaren sustained their own hard groove. Anyone who likes Acoustic Ladyland or Polar Bear would/should have been there. Buck Clayton was Count Basie’s star trumpeter in the 1930s and went on to be a fine arranger and bandleader in his own right. 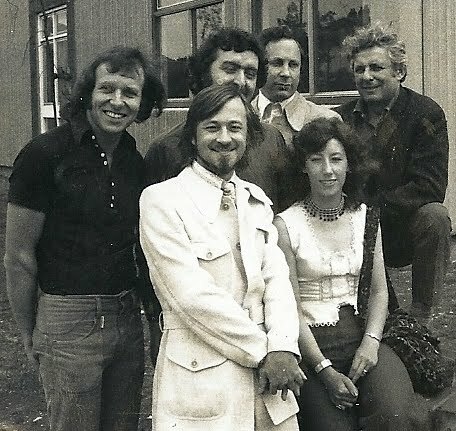 When writer, musician and broadcaster Alyn Shipton published Buck’s life story, the trumpeter gave him a set of new arrangements that had never been recorded. To celebrate Buck’s centenary, Alyn and saxophonist Matthias Seuffert brought the Buck Clayton Legacy Band to Gateshead to play this music. Alyn also introduced a short film of Buck himself. With Ian Smith and Menno Daams, trumpets; Alan Barnes and Matthias Seuffert, reeds; Adrian Fry, trombone; Martin Litton, piano; Martin Wheatley, guitar; Alyn Shipton, bass and Norman Emberson, drums it was a formidable line-up. The two trumpets were not the advertised guys (Bengt Persson + another) but were new to me. An absolute revelation.Especially since Menno Daams astounded everyone as a left handed, one armed man. Yes! one arm. These two guys swapped the Clayton part so there was no lead or second. They did great justice to the memory of Buck. The music ? Well if I'd known that I'd be asked to scribble some notes (sorry - words), I would have kept a check. However, with the memory of a seventy plus all I can recall are a couple of numbers by name; one had uncharacteristically, the egoist title of Claytonia and the other a tribute from Buck called Sir Humphrey to guess who. This apparent dementia may be somewhat excused by the fact that the arrangements were unrecorded and therefore unfamiliar to audiences. So, no Hucklebuck or Robbins Nest. All the more credit to Seuffert and Shipton for bringing them to life. Shipton, known more as jazz buff and broadcaster, gained much respect as a player as did the whole rhythmn section; the ubiquitous Alan Barnes - well what can you say other than keep going Alan! The whole programme swinged?, swang?, swung? from start to finish. If you weren't there the concert was recorded for BBC Radio 3 Jazz Line Up to be broadcast next month. 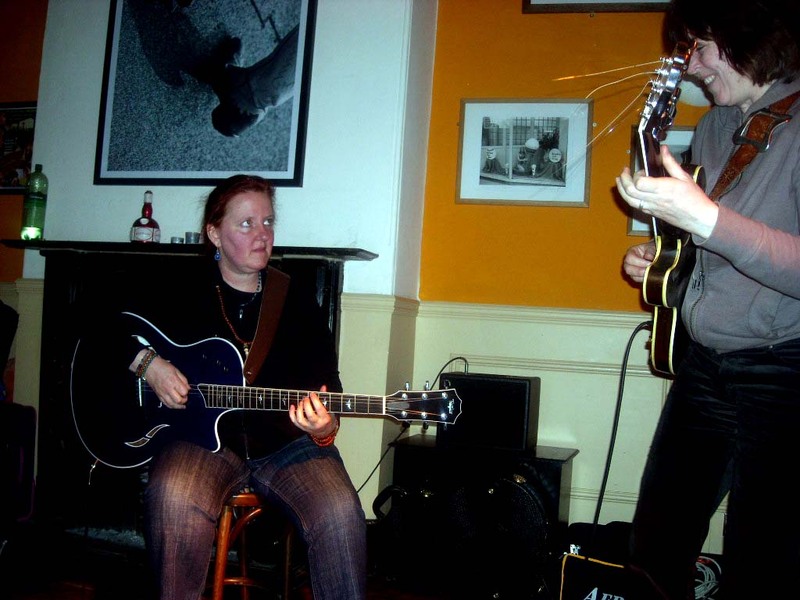 CD Review - "Emily Remembered" - Deirdre Cartwright and Kathy Dyson. It would be unfair to describe the late Emily Remler as a great woman guitarist - she was a great guitarist irrespective of gender. Likewise, Deirdre Cartwright and Kathy Dyson are also great guitarists and there can be few more fitted to paying tribute to Emily who died at the tragically early age of 32. Those of us who heard the duo Remembering Emily at the Side Café, Newcastle, back in 2009 will want this CD. Much of the music heard that night is re-created on the disc and, if anything, time has honed it to perfection. As this is only the second time I've heard the duo I can't identify who does what but who/whatever they both do it effectively. The music is a balanced mix of standards and originals all related in various ways to Inspiration Emily. In particular I liked Afro Blue/Sonnet For Emily. This is Santamaria's classic played beneath a poem by Sarah P who emotively delivers a eulogic stanza to Emily whilst D and K play Emily's original arrangement. The love, the feeling filter through. It's delicate and refined - it's impeccable. Qualities people (like myself) love and others hate. Music needs tenderness as much as aggression and this is tenderness personified - I can't stop playing it. The perfect antidote to much that passes as jazz these days! Emily Remembered by Deirdre Cartwright and Kathy Dyson available here. Solo vocal performances can be daunting - for performer and audience. Mari Kvien Brunvoll showed immense bravery in seating cross-legged with an array of electonic aids at hand to distort and transform the voice. Beguiling, beautiful, beats and bhangra. A gig beyond categorisation, simlpy exquisite. Last but by no means least up stepped trio VD to give one of the great performances of the weekend. Preparation for the gig took the form of Sunday lunch at guitarist Chris Sharkey' mother's home a few minutes from the venue. The boys must have dined well on thos Yorkshire puds . Alto saxophonist Christophe de Bezenac played some searing lines which were reciprocated by Sharkey and in the middle of them was the brilliant drummer Chris Bussey. The power, the volume, the musicianship - it was quite sensational and not for the faint hearted. 12 Points! scored ten out of ten. The annual Splinter showcase (a Jazz Action initiative) in the Northen Rock Foundation Hall featured four of the region's most accomplished ensembles. Saxophonics - Graeme Wilson (tenor), Niall Armstrong (baritone), Steve Summers (alto) & Keith Robinson (alto & sporano) - are the north east's answer to the 29th Street Saxophone Quartet. The quartet presented some new material including Niall Armstrong's Mice Heaven written in 14/8 recalling the work of Don Ellis and a Graeme Wilson piece in honour of the 29th Street band. 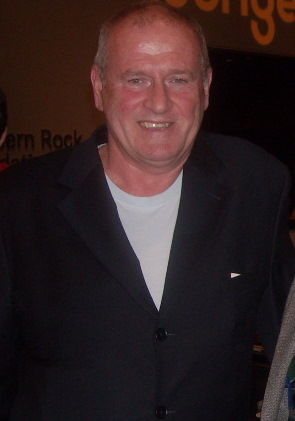 Mike Mower's tune Hiatus was given an outing as was Wilson's Stranded at the Wine Bar. This was an excellent opening set to the afternoon. The Zoe Gilby Quintet opened with Midnight Bell (a song about the Midnight Bell pub on Euston Road, London, which in turn took its name from Patrick Hamilton's novel of 1929). Charles Mingus' Dry Cleaner From Des Moines with lyrics by Joni Mitchell, Pink Floyd's Money (a duo performance by Gilby and bassist Andy Champion) and Centrepiece were but some of the winning tunes from yet another top-class set by Gilby's band (Mark Williams -guitar, Noel Dennis - trumpet/flugehorn, Richard Brown - drums and Champion). Tenor saxophonist Claude Werner followed and had it all to do. Double bass player Lawrence Blackadder and guitarist Lloyd Wright provided a solid platform for Werner to cut loose and new recruit, drummer John Hirst, played magnificently from the off. Werner can blow and blow and he did just that. A torrent of ideas poured forth on original numbers including Sitting in the Sun and the ever playful Kids. Werner garners accolades each time he plays a gig and this performance was no different. A number of people in the hall heard the Chilean for the first time and were mucho impressed. Will he ever receive a bad review? Not on this form he won't! Closing Splinter's afternoon of jazz was Nick Pride and the Pimptones. This is a class outfit. Snappy tunes, snappy dressers, one of the band's tunes - Midnight Feast of Jazz - got it just about right...a feast sure enough although not quite the witching hour! Debbie Harry photo courtesy of Mark Savage - more festival photos from Mark to follow. After This and That - Now The Other! The Jazz Festival is different for me from last year as I was very new to the Jazz World then but I’m finding my Jazz Feet now and they’re tapping away nicely on Friday evening in the Jazz Lounge, to the sound of ACV. I’d seen this band advertised many times by Lance and others, and it’s great to discover them for myself. As the brochure says, influences of prog rock, I hear Hendrix in there, and Andy Champion does so many fast chord changes that I’m worried that his left hand will fall off. Next I’m in Hall 2 listening to Soweto Kinch and it’s good to see modern elements fully integrated into jazz. I refer to the hip-hop (or is it rap, somebody tell me the difference). Anyway, one song was a call and response and then we had great fun with the freestyle, based on the word ‘freedom’. This man is an excellent verbal communicator with audiences, never mind his vibrant sax playing. Saturday and I’m in the loo at the Sage when I hear the most wonderful African singing and am tempted to rush out mid-stream so I don’t miss it. It’s ‘Hannabiell and Midnight Blue’ on the Concourse, wonderful African drums and percussion. This must have been one of the high points of the festival as it stopped everyone in their tracks. Discussion is taking place about alterations to the Jazz Lounge programme as someone is threatening to jump off the Tyne Bridge, so traffic is held up. I then find myself in the lounge, listening to Nick Pride and the Pimptones, another band I’ve only seen advertised, and such professionalism under fire so to speak, as they were obliged to do a shortened set. I’m fascinated at the way Nick manages to integrate instructions to the band into his introductions, such as ‘And horns start this one’, normally stuff he’d say offstage I suppose. The evening sees me checking out the Central Bar, long before the Jam Session, just to see the architecture, which is smart Victorian (I think) and smells fresh and clean. Packed with punters. I predict a great future for this pub. The main informal event of Sunday was to see my friends from the Sage Blue Jazz singing class doing their stuff on the Concourse with Lindsay Hannon and the Alan Law Trio. And didn’t they do well, Heather, Andrea and Gabby, all different and pleasing, with songs such as ‘All of You’ and ‘Song for my Father’. I’m out of the class this term (folk music called me back) but, (Health and Safety Warning to the Blue Jazzers ), I intend to return. Oh, I forgot to mention the delights of the Horn Dogs (Horns, with cymballed bass drum and Snare drum, a set up I’d not seen before) and the wonderful Rocket Science (jazz/rock) whom I’m pleased to say I discovered for myself long before my jazz days. And two singers with them, and one used her voice as a musical instrument when singing with the band. Must try that soon. Sage Gateshead International Jazz Festival SUBWAY MOON - Sunday March 27. The Jazz Passengers and Sotto Voce Students from The Institute for Collaborative Education (ICE) Manhattan Jambone Subway Moon Choir (students from Shotton Hall School Peterlee; Benfield School Newcastle; BA Hons Community Music course) Lyrics by ICE and CoMusica (Sage); Music by Roy Nathanson; arranged by Tim Kiah. MD; Rick Taylor. Plus many more – too many to list! Get high, get by, and get the Metro to Chi. These lyrics give an idea of the life-affirming quality of this performance which was sheer joy to see. All those people who contributed deserve medals for hard work and enthusiasm. The young people of CoMusica had worked for many months to do their part of the lyrics, and the music and production of the written programme (all the lyrics are included) and the video must have meant hours of work. Even Nexus (Tyne and Wear Metro) had provided facilities. Level 1 of Hall 1 was about two thirds full, but this multi-media performance really deserved a full house. The performance, which tells of the universal experience of city living through ideas about subway culture, began with a video of the New York Metro, then our own local Metro, and the music of the Jazz Passengers. The show included songs and rap about both metros and also a little about the London Underground, well illustrated by the video, which showed photos of the young people themselves travelling on the Metro with their musical instruments, with a background of sky, clouds or snow. For instance there was a sequence about run down Bergen Street station in New York showing the dirt and dereliction of the place; a song about a ‘Warrior’with the video showing a frightened rat who lives beneath the Metro. The lyrics about Tyne and Wear Metro were amusingly cheeky, all about fare- dodging and Government cutbacks. Roy Nathanson spoke movingly about his brother who’d died young, and imagining seeing his poems on subway platforms. The Jazz Passengers played well and adventurously and Jambone made an indispensable contribution with their spirited playing. I missed part of the performance because of another commitment, so I’d actually love to see this again. Any chance of that, do you think, Sage Organisers, who may be reading this blog? ...there was lots happening not least thirsty fans debating the merits of Byker Jazz and Tyneside Blonde - the real ales on offer. Talking of Tyneside Blondes, Lindsay Hannon and her star vocal pupils got things rolling on the concourse - a set that may be reported on separately. I was in Hall One for the Subway Moon concert so unfortunately I missed the David Carnegie Youth Group. I heard they were excellent. Guitar duo James Birkett and one of his students, Bradley Johnson gave a superb performance full of sensitivity with both returning to join the Sage's youth band organised by James - Rocket Science. Jim as conductor and Bradley in jazz/rock mode. It was a good set complemented by my plate of Pancakes and Crispy Bacon. Finally it was down to the Customs House Big Band and Ruth Lambert (pictured with David Francis on drums) to wind things up with their usual polished performance. Sage Gateshead International Jazz Festival. Dame Cleo Laine. Age cannot wither her, nor custom stale her infinite variety... The line from Antony and Cleopatra was never more applicable than tonight when applied to a modern day Cleopatra - Cleo Laine. 83 years young it was perhaps appropriate that the First Lady of British Jazz should kick off with a number from her legendary album - Shakespeare and All That Jazz - If Music Be The Food of Love. It certainly was the food of love tonight. The Grand Dame was in good voice as she ran through a selection of standards that told us that the years have a long way to go to catch up with the voice. And when those years do catch up the family have nothing to worry about because daughter Jacqui is already carrying the baton - should mama ever falter - and they'll always have a good rhythm section with son Alec Dankworth around. With Mark Nightingale on trombone, Andy Panayi on reeds, John Horler on piano and Jim Hart drums it was a tight knit ensemble that provided the perfect support. Too many highlights to name but Mother and daughter duetting on I Thought About You, Cleo, looking resplendent in a gold lamé top over a red gown, paying tribute to Ellington with Just A Sittin' and a Rockin' - one of several songs by Duke - and Jacqui's Almost Like Being In Love were high on the list of goodies as was Alec's bass feature Jack The Bear. It was a night that saw sceptics converted as they joined in the standing ovation awarded to Cleo at the end. Sometimes the best moments at The Festival - indeed any festival - are not the big time headlining acts but the feeling you get just hanging-out and meeting up with friends old and new for a drink a chat and an exchange of views. There's also the various local bands who turn up and the non local bands who don't turn up! Christine Tobin's Tapestry Unravelled was a case in point. As the throng gathered outside of the Jazz Lounge the word came through that her train was running an hour late and the concert would have to be put back. When the train was still running late at the re-scheduled time the organisers, sadly, had to cancel the concert. Earlier Nick Pride and the Pimptones (see photo by Adrian Tilbrook) had had to curtail their set owing to the late arrival - through no fault of his own I hasten to add - of trombonist Chris Hibbard. Apparently he was stuck in traffic which was held up because some guy was threatening to jump off the Tyne Bridge. This may have been a saxophone player bedazzled and driven to suicide by the virtuoso display by Claude Werner who, with his quartet, had given a mind-blowing performance in the Jazz Lounge! We shall hear more of this and the other acts from Russell. As for 'The Pimps' they played a non-stop quickfire sett of funk and soul with a new (to me) singer Susan Hamilton. She Laid It on The Line - and laid it good! Out on the Concourse I heard a fine version of St Thomas by a college band known as Arthur's Henchmen. Later came the Schmazz Factor award winners Hannabiel and Midnight Blue who stripped the paint from the walls. They raised the ante in front of a deseervedly full house. Sage Gatehead International Jazz Festival. Joe Lovano and US 5 + Mike Stern Quartet Saturday March 26. Joe Lovano (sax/clt); James Weidman (pno); Petar Slavov (bs); Otis Brown, Francisco Mela (dms). Mike Stern (gtr); Bob Malach (ten); Tom Kennedy (bs); Dave Wecki (dms). A storming set by Lovano and US Five opened the concert with the saxist excelling on some scintillating choruses on tenor, a straight alto, clarinet and soprano (I think!). He really is a master technician and he simply soared in birdlike fashion through a selection from his latest CD - Bird Songs - including Yardbird Suite, Ko-Ko, Loverman as well as some less familiar titles. Pianist Weidman filled in the gaps with some well-crafted solos of his own as did the bassist who replaced Esperanza Spalding but whose name I failed to catch (hindsight in the form of Russell tell me it is Petar Slavov. A riveting performance although many that I spoke to questioned his choice of two drummers. I couldn't answer the question - Pete Gilligan said "Because he chose to have two drummers." For me they didn't intrude and the two drum thrash at the set's end was as exciting a percussive display as I've heard in many a year. The wear and tear of the weekend began to take it's toll and I couldn't get into Mike Stern's set too deeply. He's a virtuoso player no doubt with a choice of facial expressions and leg movements that indicate that he's clearly enjoying himself but, after three numbers it all began to sound rather repetitive so I left whilst the Lovano magic was still with me. Having said that, I must confess that I found the tenor playing of Bob Malach equally stimulating and hope to catch him again sometime. Debbie Harry (vcl). The Jazz Passengers: Roy Nathanson (alt/ten); Curtis Fowlkes (tmb); Bill Ware (vbs); E.J. Rodriguez (perc); Brad Jones (bs); Sam Bardfield (vln). Northern Sinfonia conducted by Robert Ziegler. The Jazz Passengers began this concert in fine form to a full house in Hall 1, playing an up tempo number with lively African influenced vibes, and a free jazz feel from these superbly talented musicians. Unfortunately, that was the high point of the concert for me. This was billed as a song cycle, and songs were about subjects such as Economic Malaise; Sad Story; and even one about losing your mind. Debbie Harry sounded to me more like a cabaret singer than someone doing jazz, apart from her first song, a standard - Imitation of a Kiss. Roy Nathanson (pictured above - centre) introduced each item but I had difficulty making out some of what he said, and didn’t catch the off-beat comedy which was mentioned in the Sage programme. The solos played by The Passengers during the songs were very effective however, especially from trombone and sax. The Northern Sinfonia, played well with a mostly ‘string’ sound, but I was wondering what they really had to do with the rest of the performance, as it seemed that too many disparate elements had been forced together for this event. I’d have preferred to see the three elements separately; Debbie Harry doing pop, which she does well; the Jazz Passengers doing esoteric jazz; and the Orchestra keeping away from esoteric jazz musicians and playing accompaniment for jazz standards. It’s the same problem that symphony orchestras have with folk music; it seems to me that the two just don’t mix. The concert was well received and Debbie Harry got an encore, so maybe I’ve missed something. I’d love to hear from someone who enjoyed this concert posting their views. Soweto Kinch (alt/vcl); Femi Temowo (gtr/vcl)); Karl Rasheed-Abel (bs/bs.gtr); Graham Godfrey (dms). Ninety minutes unbroken seemed to fly past in ten! A truly amazing performance that somehow managed to incorporate Rap, Hip-Hop and goodness knows what else and still come out as Jazz! Kinch is a superb alto-player - the history of the alto sax comes out in his playing from Hodges to Bird to Dolphy to Ornette - and then some! Add the aforementioned Rap and Hip-Hop and you have a totally original take. The music is inspired by many aspects of life. Be it yesterday's emancipation or today's financial meltdown Kinch somehow manages to do it with good humour no matter how controversial the subject matter. Typical was the freestyle finale where he rapped on Freedom in response to words thrown at him by the audience. We got Finance, Robbers, Existentialism, Equity, Dollars, Osborne (George) and Money. Apart from Soweto Kinch, Femi Temowo did the business on guitar complementing and matching the leader solowise. Bass kept it together and drummer God was Omnipotent! A good opening day to Gateshead 2011. PS: Debbie Harry review to follow. Sage Gateshead International Jazz Festival - ACV – Friday 25th March 2011. Andy Champion (bass), Adrian Tilbrook (drums), Paul Edis (piano/ keyboard), Graham Wilson (baritone/tenor sax) and Mark Williams (guitar). The first time I heard ACV I didn’t like them! If that sounds heretical please bear in mind that I have admitted (on this website) to being an ignoramus. Several gigs later, having moved from incomprehension to qualified approval, the Sage tonight was my “Damascus” (via the Bridge and Whitley Bay): I am converted! It was brilliant, from start to (all too soon) finish. I wanted to shout: “Put Soweto Kinch on hold – give us an encore”! Throbbing bass began it on A Line Made by Walking, and an amazing bowed bass solo brought the house down at the end on Without Bones. The latter ended with a HUGE crescendo: the former ended suddenly. Endings came in two forms tonight – ones that haven’t finished when you think they have, and ones that finish before you realise. Both types caught me out (ignoramus!) and typified this band’s inventiveness and unpredictability. Second up was a more lyrical “debut” piece called Dust Red – was this inspired by Consett Ale, I wondered? This was followed by the enigmatic anagramatical Giant Mice – more funky than lyrical - and quirky (in spades! ), starting as it did with Paul’s synthesised mouse intro and leading into enthusiastically received solos from him and from Mark. Andy’s anecdotal announcement of the next number, Nutmeg State, mentioned both Old Peculier (so last season) and Brandy-Milk Punch – hence my speculation about Consett Ale. No, I was NOT aware of the hallucinogenic properties of nutmeg, but this gave a flavour (so to speak)! In my note-pad I wrote the following: “MAD!!! Killer-bees!? Dali does jazz? ATTACK ALL INSTRUMENTS”! (And I was drinking water at the time!) Never Ever – announced by Andy as the “total opposite” - calmed things down with an almost classical feel (piano and bowed bass) until Mark’s guitar ramped it up to a rock-style crescendo before falling away again to a quiet (and for once expected) ending. It was the last “quiet” of the night as Fail in Wood (did I mention that the boys have a CD out by that name? Well worth buying, on tonight’s evidence!) was followed by the aforementioned Without Bones, the kamikaze pace of which left even an ignoramus impressed with the musicians’ brilliant timing. So my first encounter prompted the comment: “I’ve never heard anything like it! ” - as did tonight’s performance, but what a world of difference in meaning between those two utterances! Maine Street Jazzmen (and woman) @ Rosie Malone's. Olive Rudd (vcl); Ray Harley (tpt); Herbie Hudson (vcl/hca/vcl); Jim McBriarty (cly/vcl); George Richardson (pno); Alan Rudd (bs); Mike Humble (dms). There were withdrawal symptoms all round amongst the regular Thursday afternoon gang after missing a week of good time dixieland jazz. However, when Hot Lips Harley stomped off Way Down Yonder in New Orleans all was well again. Whispering Jim McBriarty did the vocal on this one. Jim also whisked us around the metaphorical dance floor with The Varsity Drag. Maybe it was the absence makes the heart grow fonder syndrome but all 7 seemed to be absolutely at the top of their game today and whether it were Jim's melodically sound solos, Ray's textbook technique (plus a lot of phraseology that you won't find in Arban! ), Herbie's tailgate or his blues harp blast on See-See Rider or George's exquisite piano work, or Alan and Mike's sympathetic support - whatever this was one of the better ones. Plus we had "Maxine Fitzgerald-Holiday" excelling on Swing That Music, Some of These Days, My Melancholy Baby and Bourbon Street. 12 Points! at Gateshead Northern Rock Foundation Hall 2:00pm. Sunday March 27. Sunday afternoon in the Northern Rock Foundation Hall features the best of Europe's emerging talent on the contemporary jazz scene in a three set concert. Donkey Monkey is a duo of French pianist Eve Risser and Japanese drummer Yuko Oshima in which piano meets Japanese rock in a glorious cacophony of sound. Norwegian vocalist Mari Kvien Brunvoll uses loops and other electronica to produce a personal take on the jazz world. trio VD return to Tyneside to play what is guaranteed to be a storming set. Guitar wizard Chris Sharkey, born and bred just up the road from the venue, will take the stage with alto saxophonist Christophe de Bezenac and drum demon Chris Bussey. The Northern Rock is sure to be rocking Sunday afternoon. Soweto Kinch Quartet - Hall Two. 9:30pm. Friday March 25. Friday evening 9:30 pm is treat time. The Soweto Kinch Quartet hits the stage in Hall Two just as ACV will have torn it up in the adjacent Northern Rock Foundation Hall. Kinch is an assured, young master alto saxophonist. Raised in Birmingham, England, he can hold his own with any of the American big boys. Politically engaged (as many American jazz musicians were and are) he is ''the real deal''. A multiple award winner for one so young, Kinch emerged from the ranks of Tomorrow's Warriors to follow his own path in the music. A fusion of hard-edged, blues drenched, bop and post bop with hip hop works brilliantly and those with an aversion to hip hop should do themselves a favour and get along to this gig as they are sure to get a surprise...a pleasant surprise. The adrenalin is mounting, the heart beating faster, there is a sense of occasion - The Sage Gateshead International Jazz Festival is almost upon us. This year, as indeed every year, it is a mixture of the familiar, the unknown and the tantalisingly intriguing mix that may or may not work but that you just have to see even if it's just to say "I was there!" Not that their is much room for failure - it has been carefully worked out and I think that, after the final concert - whether it be Cleo or the Gasgow Improvisers - there will be few who won't be counting the days until next year! So come on "Blondie" show us your jazz chops! The Seventh Sage Gateshead International Jazz Festival runs from Friday March 25 to Sunday March 27. Full program here. Pinetop Perkins dies age 97. The death of blues piano man Pinetop Perkins on Monday March 22 at the age of 97is surely proof that not all blues men die young. Obituary. Lance. Jo Harrop (vcl); Paul Edis (pno); Mick Shoulder (bs); Rob Walker (dms). An evening that showed due reverence to the Gasbook which this pundit didn't mind at all! Rodgers and Hart, Cole, Irving and George G were all represented. Looking resplendent in a figure hugging black gown, Jo took us East of the Sun with more than a hint of Anita O'Day in her interpretation. Lady is a Tramp, The Man I Love and My Favourite Things were served up and, in the latter, I wanted to insert the line - Morteaux Sausage, Salsify and Wild Mushroom as this starter was certainly one of my favourite things. Autumn Leaves, Fine and Mellow with some fine and mellow blues piano from Paul who played the blues as if he'd learned his craft in a Basin St. bordello! Cheek to Cheek, This Can't Be Love and I Could Write a Book got the second set up and running - despite having an ear infection it didn't stop Jo from swinging things along. Paul too was on the receiving end of a migraine yet in 'Book he managed to insert a most appropriate quote - Good Bait - just as my Poached Pear, Almond Gratin and Chocolate Sorbet arrived - this was good bait indeed! My Funny Valentine, a medley of Summertime, the Hi-Di-Hi bit from Minnie The Moocher (with audience participation) and Fever with a suggestion of Miles' So What hovering beneath it all. Just One of Those Things, Every Time We Say Goodbye and I Wish I Knew How It Felt To Be Free brought the show to a close. Although this was the fourth consecutive night the restaurant was close to capacity as I believe it also was on Saturday. Mick Shoulder and Rob Walker supplied the rhythmic underpinnings with Rob's sympathetic brushwork impressive and Mick's harmonic foundation just perfect. I think most musicians in the north-east and beyond know of the axe brandished by Northumberland Centre for Creative and Performing Arts that's hanging over the head of ace trumpet player and brass teacher Dave Hignett. Rightly so, many of his pupils past and present have registered a protest on Facebook and a petition has been duly launched to try and persuade the council chiefs to have a change of heart. As such, I would like to suggest that all who read this and bemoan the fact that a person described as "An inspirational music teacher" could be prevented from passing on his unique skills, sign the petition on the Northumberland County website - as well as logging on to the Facebook page. PS: Please note the original link was incorrect and, thanks to David Francis, has now been put right. Jo Harrop at the Cherry Tree TONIGHT! Tonight - March 21 - sees popular vocalist Jo Harrop complete her 4 night stint at the Cherry Tree Restaurant, Jesmond. Jo who has appeared several times previously at the Osborne Rd eaterie will be accompanied by the Paul Edis Trio. An event not to be missed by lovers of good music and good food. PS: Take out the 'good' and substitute fabulous! Mark Williams (gtr); Paul Susans (bs); David Carnegie (dms). Tonight it was jazz played by 3 master technicians who swung whilst exploring many of the varying aspects of the jazz canon. Mark Williams was at his inventive best - his technique is phenomenal and he does it with so much feeling and underlying emotion. Paul Susans, as well as playing double bass and bass guitar also had some original compositions of which Gamblin Man - dedicated to the late Paul Gamblin - was particularly outstanding. I hope Paul's family get to hear this as it is, quite simply, quite beautiful. David Carnegie? He never ceases to amaze! both in solo or solid support our man is there! Put these three guys together and you have THE TRIO! Sarah Travena (sop); Stuart Findon (ten/bs gtr); Fiona Littlewood (ten/vcl); Pete Gilligan (pno/dms); Colm Rooney (pno); Eric Stutt (dms/vcl); Elaine Binney (vln); Ray Burns (hca); Paul Grainger (bs) Claire Kelly (vcl). The Jazz Café is as good as it gets on a Sunday afternoon. Domestic upheavals - don't ask! - meant I was late arriving at the Jazz Café but my brief stay was long enough to enjoy Claire's Love Me Or Leave Me, Fi's Gee Baby Ain't I Good To You and There is No Greater Love. Jazz Rascallette Elaine fiddled whilst Ray burned - it was suggested that were there a jazz scene fashion contest Ray would win it by a country mile. Our man in Hong Kong - Colin Aitchison - sent me this wild jam session video of some guys from the cruise ship Queen Elizabeth who sat in at Kowloon's Jazz Saloon Ned Kelly's Last Stand and did some chasin' on - Straight No Chaser! Lance. Preview: Sage Gateshead International Jazz Festival - 6. This really is a festival that promises to deliver much - particularly from 'cross pond - Joe Lovano, Debbie Harry, the Jazz Passengers etc. However, let's not forget the UK content (Cleo, Martin Taylor, Soweto Kinch and others) they will be an equally big an attraction to many. There is also a third dimension to this festival and that is the local input. On Friday, Northern Rock Foundation Hall at 9:30pm, the quintet ACV comprising of local heroes Andy Champion, Graeme Wilson, Adrian Tilbrook, Paul Edis and Mark Williams make their contribution to the happenings and, believe you me, they won't be lost in the shake-up! Saturday afternoon, in the Jazz Lounge, Jazz Action presents Splinter @ The Sage a noon extravaganza that takes in the afternoon with sets by Saxophonics, Zoe Champion (nee Gilby) Quintet, Nick Pride and the Pimptones and the Claude Werner Band. This gig is free but ticketed so get in there! Recreating the halcyon days of the Elephant Jazz Club ace guitarist James Birkett is the special guest with the Maine Street Jazzmen next month. One of James’s first appearances on the North East jazz scene was in November 1989 when appeared with the River City Jazzmen at the Elephant. 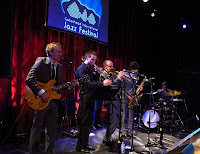 James is now based at Gateshead Sage where he is Director of the BMus(Hons) Jazz, Popular and Commercial Music Course. The Maine Street Jazzmen are a popular Tyneside based traditional jazz band. They have played regularly at Ashington Jazz Club for over fifteen years. The band is made up of experienced local musicians led by Herbie Hudson on trombone, harmonica & vocals. Ray Harley (2002 BBC jazz musician of the year) is on trumpet along with Jim McBriarty on clarinet & sax. Malcolm Armstrong (for many years a music lecturer at Ashington Tech.) is on the keyboard, with Mike Humble on the drums and Alan Rudd on double bass. Olive Rudd will add some exquisite vocals. The repertoire of the band is taken from the classic jazz tradition. The concert is on April 6th at the Elephant pub in Ashington, starting at 8:30 pm. and is part funded by a grant from Ashington Town Council. Bebop Spoken Here raved unreservedly about Elaine Binney and the Jazz Rascals after their live recording session at Durant Hall and I'm pleased to announce that the launch party for the resulting CD is scheduled for May 1 at Barn Asia (opposite Discovery Museum). Elaine promises an evening of fun and surprises from 7:30pm (doors open), 8:00pm (surprise entertainment) leading up to the band's performance at 9:00pm. Elaine says: we're making it an event where people can come along at any time to enjoy the night with very reasonable drink prices in an amazing venue! The restaurant will remain open afterwards so people can talk to the band and have a bit of a jazz-social! The Rascal's line up with Elaine on violin, Peter Skeen (gtr/vcls), Keith Mills (bs) and Jae Brooks (dms). Bebop's Ann Alex reviewed the Durant Hall session here. Check out Elaine and the Rascals' new website - http://www.elainebinney.co.uk/ . Listen to a YouTube clip of the original composition Swan Like. They're a band who have brought a new approach to a time-honoured format with original compositions and original takes on standards. This is a band that deserves to be taken on board - they are young, talented and deserving of the widest possible recognition. PS: Tickets are £5 But, if you've pre-ordered a cd (can do on the website) it's free if you bring another paying person. Okay so he wasn't a jazzman although in his early days he began on clarinet and did initially dabble in the art of jazz. However, as, in my youth, I also had an appreciation of The Shadows early stuff (The Rise and Fall of Flingel Bunt etc) I make no apology for mentioning his passing. Jet died today (March 18, 2011) aged 71. Obit RIP. Lance. Andy Hudson recovering from heart attack. Well known entrepeneur, former bandleader, pianist, Andy Hudson recently suffered a heart attack whilst undergoing nasal surgery. I'm pleased to report that he is on the mend and, he tells me, good for another 25 years! 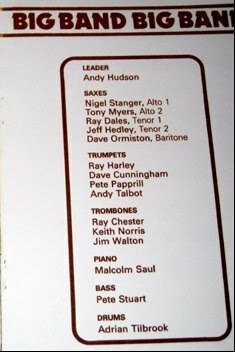 Whilst reminiscing out of tempo Andy drew my attention to a big band he put together during the legendary Cleveland Jazz Festival of 1978 that he co-promoted with George Wein. - I wonder if many of our readers were there! Mark Lockheart (ten); Annie Whitehead (tmb); Trevor Warren (gtr); Dudley Phillips (bs); Winston Clifford (dms). A faultless performance that, particularly in the first set, I wanted just that little bit more from and didn't quite get. The second set was better and at times reminiscent of Mingus's rich harmonic structures whilst escaping the neo-blandness of the first set. The gig - a Jazz North East in conjunction with Gateshead Council promotion - was well attended. Darlington jazz supremo Peter Bevan kindly sent me this photo of Tony Levin who died recently (is it my imagination or are drummers leaving us at a greater rate than other instrumentalists?). I'll let Peter describe the context of the photo. "It was taken in Bromborough in Wirral around 1973 during a Poetry & Jazz in Concert Tour for Merseyside Arts Association. I'm sure you'll recognise the jazzers but the full line up is Tony, Michael Garrick, Dave Green, Jeremy Robson, Norma Winstone and Dannie Abse." Peter also sent me copies of two of his recent reviews for the Stockton & Darlington Times. Steve Fishwick/Osian Roberts Quintet at Darlington Arts Centre. Vasilis Xenopoulos at St Chad's College, Durham. Cleo Laine Hall One 8:00pm. Sunday March 27. The grand finale to what I am sure will have been a marvellous weekend. Dame Cleo is an instituition - not just of British Jazz but of Music - period. 83 year old and still astounding the fans the lady can interpret practically anything and make it her own. With son Alec Dankworth on bass and daughter Jacqui also in the vocal department this promises to be the most memorable of occasions. Inexplicably, it is many many years since I last heard Dame Cleo in person and I can't wait to rectify this. The only sadness is the fact that Sir John Dankworth is no longer with us. Sue Ferris (ten/flt); Stuart Collingwood (pno); Neil Harland (bs); Paul Smith (dms). The trio got things rolling with Bye Bye Blackbird before Sue opened up with All The Things You Are - chorus upon chorus of fanciful flights. My starter was Bayonne Ham with Salsify, Poached Egg and Hollandaise and I too could wax lyrical over this delightful delicacy but rather than list all the things it is I'll merely say Très Magnifique! All of Me bounced along nicely Sue once again cutting the mustard as did indeed the guys behind her although, of course, there wasn't any actual mustard on the menu. What was on offer though was the Bavette Steak-Frites with Bearnaise Sauce - a dish to die for! A switch to flute for the multi-titled Theme From Black Orpheus (a.k.a. Carnival and A Day in the Life of a Fool) which over a bossa-nova rhythm was the perfect accompaniment to Poached Pear, Almond Gratin and Chocolate Sorbet. Yummy, Yummy this was both hot and cool. The set finished with Sue back on tenor for Love Is Here To Stay - with such a combination of food and music I guess the Cherry Tree is here to stay. Next Friday is the start of a four nights residency for singer Jo Harrop with the Paul Edis Trio. Sean Noonan (drums & vocals) v. Matthew Bourne (keyboards). Laydeeeeze and gentlemen. Tonight's main event, brought to you by Jazz North East in association with Jazz Action here at the upstairs gym of the Bridge Hotel features the contender from Birmingham, England... introducing keyboards wizard Maaaat Bournnnnne! And the undisputed heavyweight champion (probably middleweight - Ed) from Brooklyn, New York City... drum sensation Sean Nooooonan! NYC's Sean Noonan matched up with the bearded Matt Bourne for a night of...well, we were about to find out. Noonan entered the ring clad in a hooded gold coloured boxing gown looking mean, focussed on the job ahead. If Bourne was intimidated he didn't show it. Seconds out! Round 1! Noonan was to tell us a story; a fairytale, a Grimm tale, a nightmare tale. The New Yorker's vocal style was akin to that of a performance poet delivering crazy lyrics with a wide-eyed stare into the abyss and then a wide-eyed stare into the soul of each and everyone present. This was Zappa, this was Beefheart, this was Dr.Chad, this was Zorn, this was Norman Bates and by the way...Whatever Happened to Baby Jane? He assured us that he was abandoned at birth and brought up by a coyote - I was tempted to believe him! Pecos Bill and Silke from the Sea were weird tales from Noonan's vertile but weird imagination which can be heard on the CD Set the Hammer Free. A journey across a Bavarian landscape featured an appropriate comic touch from Bourne. There was a pause in Noonan's storytelling to showcase some serious heavyweight improv from the duo in Improv Bouts and it produced some breathtaking playing from both musicians and it all but drew the breath of the audience. Noonan is a superb technician, so much so that he can juggle sight reading and invention with the humourous strand running through the material (instrumental and vocal). Drunken Landlady, supposedly inspired by Noonan's Brooklyn landlady seeking ''favours''' had the audience rolling in the aisles - funny that he now lives a travelling life away from the Big Apple. A heart felt finale was John Henry. This was another tale, a true tale, about the eponymous hero and his heroic efforts in challenging the introduction of the steamhammer and it produced yet more brilliance at the drum kit and keyboards. This was a memorable night for those with a sense of humour. Russell. PS: Photo from Adrian Tilbrook. Dish of the Day at the Cherry Tree Restaurant (9 Osborne Rd., Jesmond - tel 0191 2399924) is Tenor saxist/flautist Sue Ferris w. Stuart Collingwood (pno), Neil Harland (bs), Paul Smith (dms). Sue is one of the swingingest players around and with equally groovemaking Stuart Collingwood Trio behind her it is a recipe full of mouthwatering ingredients. Music starts around 7:30/45pm. Treat your tastebuds tonight. Lance. An extraordinary mix of musicians from New York and Tyneside will join together for a very special commissioned piece, Subway Moon, to be performed during Gateshead International Jazz Festival at the end of March. Conceived by New York composer and musician, Roy Nathanson, Subway Moon will showcase the result of months of creative energy from a huge ensemble of teenage lyricists, singers, rappers and musicians from both sides of the Atlantic. Subway Moon explores a shared experience of city living that is common to generations across the world as we bustle through the underground tunnels and it discovers the impact of subway culture through sound, music, words and video. Work began on the project months ago when CoMusica students at The Sage Gateshead wrote the lyrics based on their experiences of Tyne & Wear’s Metro. They sent numerous songs to Roy Nathanson who has since worked on the music composition which will be played by The Sage Gateshead’s youth jazz ensemble, Jambone, and sang by Benfield School choir, Shotton Hall School’s choir and students from The Sage Gateshead's BA (Hons) Community Music course along with rapper Rick Fury. In addition, the CoMusica students along with students from New York are producing visual images to accompany the show. Joining them on stage will be 25 young musicians from New York who are coming to The Sage Gateshead especially for the performance, as well professional musicians including beatboxer Napoleon Maddox and New York bands, The Jazz Passengers and Sotto Voce. Roy Nathanson adds: "The real excitement of this project is now; it's hearing that the Tyneside songs really are taking shape, that the Chorus is learning them and that Jambone is kicking. My own kids in New York can't wait to get there and I'm just so curious to hear the pieces that we'll all play together, including my band Sotto Voce. We have come up with some great videos of the young people from New York to be shown throughout the event. One is called "I am a Warrior" and is an ode to the survival instincts of a New York city rat and of course has great rat footage. They are hilarious and visually beautiful; it will be something to see!" This is going to be a huge production with ninety minutes of newly created fast-moving urban music and visuals. This is something that is exciting for everyone, not only in the region but the UK and worldwide and a great chance to share the cultural scene that NewcastleGateshead has to offer. Tickets for Subway Moon are £7 from 0191 443 4661, at http://www.thesagegateshead.org/ or in person from The Sage Gateshead’s Ticket Office. Mark Lockheart (reeds); Annie Whitehead (trombone); Trevor Warren (guitar); Dudley Phillips (bass); Winston Clifford (drums) I saw this band a few years ago at the Cluny, and they were a revelation. Probably shouldn’t have been, because any group that includes top players like Mark Lockheart and Annie Whitehead is pretty well certain to deliver quality, but it was the compositions of leader Trevor Warren – probably the least known member – that gave it an added dimension. He spends most of his time in Spain, which may account for his relatively low profile, and there’s a Spanish tinge to some of his writing, but he also dips into other international influences, as well as borrowing the energy (but not, thankfully, the sometimes directionless thrash) of jazz-rock. The other members of the band – Whitehead in particular – relish the opportunity to take a stylistic world tour, delivering driving ensemble playing and tremendous solos. Very highly recommended. From Paul Bream's Jazz Alert. Farewell Joe Morello - R.I.P. Just heard the sad news that Joe Morello has left us age 82. Joe was perhaps the last drum giant. I heard him many times with Dave and never ceased to be amazed at his technique. Joe could swing in any time signature and added a special dimension to the Brubeck 4. My favourite memory of Joe concerns Alan Ingham - a drummer I was working with in a club back in the '60s. Alan got married on a Saturday morning. In the afternoon he went to a Joe Morello drum clinic. In the evening he played at the club. Yes, many drummers placed Joe Morello high on their list of priorities. Listen to Joe on You Tube. Peter Gilligan (pno/dms); Paul Grainger (bs); Omid Ramak (dms); Stuart Findon (ten/bs.gtr); Doug Fielder (ten); Colm Rooney (pno); Mark Williams (gtr); Ryan ? (dms). Good sounds today at the Jazz Café. For once the vocalists were absent - Gaby was around but no mic for her to hypnotise the audience with. The two tenor frontline gave an almost (almost!) Jazz Couriers' sound to the ensembles and Stuart was in blistering form. In fairness it has to be said that Doug too is acquiring an identity. Well You Needn't was a real toe-curler. Mark Williams and Pete were at their most belligerent best taking jazz on a trip to Mars and back. Mars? when these two hit paydirt (musical variety!) it's Pluto or nothing! The drum section also did the biz. Colm Rooney played a few on keys with Pete moving on to drums - nice one Colm nice one Pete. Omid made the kit sizzle as did sitter in Ryan. A Punk Rocker, Ryan had recently returned from playing in Lebanon, he proved that genres can complement and he brought that into play. Tonight's Splinter offering is done in conjunction with the On The Outside Wing of Jazz North East and features American drummer Sean Noonan and UK keyboardist Matthew Bourne. Noonan describes it as "A fermentation of shape-shifting improvisations, stories of minimalism and intoxication that wander through dense soundscapes. As if Cecil Taylor and Samuel Beckett were out on a night of romance and in quest of a good bar fight." Bourne To Brew: Bridge Hotel, Castle Keep, Newcastle. 8:00pm. £7/£5. Hey There - you with the stars in your eyes. My Old Flame! (Can't even remember his name!) I Remember You - you're the one who made my dreams come true. What's New? How is the world treating you? I'm a Little on the Lonely Side Tonight. So! You met someone who set you back on your heels? Goody Goody! Day after Day, I'll always love you. I Can't Believe That you're in Love With Me. Meet Me Tonight in Dreamland. Maybe. Please - lend a little ear to my pleas. Alright, Okay, You Win. Where or When? There's a Small Hotel - by a wishing well Heartbreak Hotel - on the corner of Lonely Street? No - I do my Jumping at the Woodside. I Love you Samantha. Nancy - with the laughing face. I Apologise. Too Late Now. (Couple exit in opposite directions). Lance. PS: Alternative song scenarios invited. Hi Lance, Just thought you might like to take a look at this http://www.youtube.com/watch?v=MiRxLgyN_Lo&feature=related he's 12yrs old!!. Soon to appear at Ronnie Scott's. Jane and Valerie Harley's link. Customs House Big Band with Ruth Lambert @ Blaydon Jazz Club. March 10th. Jill Brett, George Robinson, Alan Marshall, Tom Quillan, Chris Kaberry(saxes); Gareth Weaver, Chris Gurgi-Smith, Michael Fletcher Peter Morgan (tmb; Paul Riley-Gledhill, Kevin Eland, Ken DeVere, Bob Temple(tpts); Bill Brittain (pno); Alan Smith (bs); Roy Willis (gtr);David Francis (dms); Ruth Lambert (vcls). In these difficult economic times Blaydon Jazz Club pushed the boat out to present the eighteen piece Customs House Big Band. The club's regulars turned out to hear a cracking band led by genial MD Peter Morgan. The band opened with Love For Sale with Jill Brett playing some sensuous alto and Alan Marshall prominent on tenor. Simon and Garfunkel's Keep the Customers Satisfied worked, perhaps against expectations, with Brett featured once again. The award winning vocalist Ruth Lambert strolled onto stage to sing the first two of several numbers - Time After Time (Sammy Cahn/Jule Styne) and Come Fly With Me. Lambert respects the lyric yet, as with the all great singers, she interprets the material with a highly developed jazz sensibility. All big bands should have a powerhouse trumpet player and the Customs House band is no different; up stepped Kevin Eland for a blast on Maynard Ferguson's Gravy Waltz having heard Tom Quillan set the pace with a brisk workout on tenor. The band's ensemble playing was better than ever and was heard to great effect on I Love Paris. Ms.Lambert returned to the stand to serve some Black Coffee and stayed around to sing I've Got the World on a String. Refreshed, the second set opened with Witchcraft and the spell was cast with first class ensemble work with altoist Brett featured once more. An unfamiliar tune to this reviewer was Semi-Mental Journey by Los Angeles based composer Jim Martin. The title alone made this one a winner. It is, of course, based on the changes of Sentimental Journey. Gurgi-Smith, Quillan and Brett took the spotlight. The band breezed through Sweet Georgia Brown before vocalist Lambert returned once more for perhaps the highlight of the evening. At Last, with great tenor from Marshall, was a knock 'em dead performance from one of the finest singers in the land. The ensemble playing on In a Mellow Tone (full marks to the rhythm section of Bill Brittain & co.) was text book stuff and Lambert sang My Funny Valentine with excellent use of brushes by drummer David Francis. One number after another, this was a winning performance by the Customs House Big Band. The jazz police loved every minute of it and they loved The Jazz Police by Gordon Goodwin! Time to go, but not before a rousing encore by the band and Ruth Lambert declaring Alright, Okay, You Win. The band's next engagement is a two-nighter back at HQ (South Shields' Customs House). March 31st & April !st are the dates for your diary. Blaydon Jazz Club's next concert features the impeccable Roy Williams with the Blaydon Jazz Quartet on April 14th. Please note that this one starts earlier than usual at 8:15 pm. There will be a buffet, raffle and maybe some Christmas crackers as Williams' scheduled appearance in December was cancelled due to the blizzard-like conditions in the north east. Get there early, it could be standing room only. Buck Clayton Legacy Band. Sunday March 27 - Hall Two 2:00pm. This should be a worthy tribute to the late Count Basie trumpet star Buck Clayton. Broadcaster and writer of a Buck Clayton biography, Alyn Shipton not only introduces audio and video clips of the great man but also plays bass with the band. The complete line-up is Patrick Artero, Bent Persson (tpts); Alan Barnes, Matthias Seuffert (reeds); Adrian Fry (tmb); Martin Litton (pno); Martin Wheatley (gtr); Alyn Shipton (bs); Norman Emberson (dms). Away from the cutting edge end of The Festival the afternoon concert may well provide a chance to chill-out and reflect upon the music's roots. As an added incentive Shipton has acquired some previously unrecorded arrangements by Buck Clayton. And if that ain't enough to get you to the Box Office - the ubiquitous Alan Barnes is in the band! Ray Harley (tpt); Herbie Hudson (tmb/hca/vcl); Jim McBriarty (clt); George Richardson (pno); Alan Rudd (bs); Mike Humble (dms); Olive Rudd (vcl). Another sizzling serving from the Maine Street stompologists. Ray Harley was back leading them to the Gloryland and George Richardson once again depped for the Tunnel-Syndromed Malcolm Armstrong. George did the biz. Herbie re-incarnated Albert (driving in his Sunbeam Talbot) a.k.a. Ja-Da. The semi-risque lyrics bring squeals of delight from a couple of ladies who'd obviously never followed the River City Jazzmen many long years ago. Jimmy was, as ever, Mr Cool on clarinet. His silky solos contrasting nicely with Herbie's growling, slushpump shouting and Ray's beautiful brashness. Olive opened up with I'm Crazy 'bout My Baby and finished with Soon - too soon for this listener! No session next week as it's St Paddy's Day when, no doubt, there will be some emerald green activities taking place! Missed this one but better late than never! Tonight the ZOE GILBY QUINTET are in concert at Bishop Auckland Town Hall. 8:00pm. Lance. A YouTube clip from Elaine Binney and the Jazz Rascals' recent live recording soon to be released. Lance. The Impossible Gentlemen will be at The Sage in a little while. As the previews for The Sage Gateshead International Festival appear let's not forget that there is also jazz-life after The Festival and indeed throughout the year. One such event is The Impossible Gentlemen on Friday June 10. This high profile quartet comprises Gwilym Simcock (pno), Mike Walker (gtr) and the Americans Steve Swallow (bs) and Adam Nussbaum (dms). Multi award winning pianist Gwilym Simcock has been name checked as a "genius" by no less a person than Chick Corea and has worked extensively throughout Europe with the cream of British and international jazz artists including Dave Holland, Kenny Wheeler, Lee Konitz, Bill Bruford’s Earthworks, Bob Mintzer and Bobby McFerrin. Mike Walker is regarded as one of Europe's most exciting guitarists and has worked with George Russell's The Creative Jazz Orchestra, Vince Mendoza, Anthony Braxton, Bill Frisell, Tim Berne, and Mark-Anthony Turnage. Steve Swallow is regarded as the leading exponent of the bass guitar and his illustrious career spans decades of playing many of the great - Paul Motian, Lee Konitz, John Scofield, Carla Bley, Chris Potter and many others. Steve and his long-time friend and rhythm section partner Adam Nussbaum have worked on many projects together. Adam's work with Michael Brecker won a Grammy in 1988. This brand new project is full of inspirational improvisational playing. They will be performing new music written specially for the quartet by Gwilym, Mike Steve and Adam. Hear them in concert at Budapest. Tickets are now on sale from the Sage. Joe Lovano w. Us Five/ Mike Stern Band. Saturday March 26 7:30pm Hall One. Joe Lovano was last at The Sage with McCoy Tyner was it 2? 3? years ago. He impressed me on that occasion and I'm sure he will again with Us Five - a swinging 2 drummer quintet. Lovano is a player who floats in and out of modern genre with ease and great panache as well as putting the boot in when the music demands it. A winner of enumerable Downbeat polls this promises to be an evening of jazz at the highest level. Listen here. With the highly acclaimed guitarist Mike Stern and his Band replacing Kurt Elling in this double bill the expectations are mega high! However, there is a downside to this particular evening. Over in Hall Two running almost simultaneously Martin Taylor gives a solo performance. Putting two of the worlds greatest jazz guitarists on at the same time is to say the least frustrating. Admitedly they are diametrically opposed stylistically yet I'm sure there are many guitar people who would want to catch both. Still I suppose the logistics make some things unavoidable and I guess Elling's withdrawal did through a spanner into the works. Perhaps Martin and Mike will jam at the Central Bar late nighter? It's Ornette Coleman's 80th birthday today. Listen here. Lance. 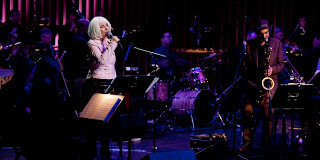 Debbie Harry , the Jazz Passengers and Northern Sinfonia. Friday March 25 Hall One. One thing about The Sage Festival organisers is that they don't play safe and take the easy options. Instead they look for the 'different' and this, the opening concert, is certainly different. When talking of jazz vocalists Debbie Harry isn't the first name to roll off the tongue - in truth it's probably the last! However, come the evening of March 25 all that could change. The former punk rocker will surely bring the zesty hands-on no nonsense verve of punkdom to the once alien world of jazz resulting in a fusion of sound that can only be conjectured at. With the Jazz Passengers adding their brand of musical mayhem to the maelstrom and the Northern Sinfonia riding the storm this is going to be a night to remember of titanic proportions - one way or the other. Don't miss it! Hear Debbie and the Passengers do Stormy Weather. Full Festival Program. Lance. HCW - Splinter @ The Bridge Hotel, Newcastle.